Benefits of truck mount carpet cleaning in Marysville, WA. Keeping your carpet clean is not easy especially if you have small kids and pets but it is even harder for you to find a good carpet cleaning company. Many companies come to your home with bulky carpet cleaning equipment that disrupts your home and your schedule. Truck mount carpet cleaning can offset these disruptions because this type of cleaning comes with numerous advantages that conventional carpet cleaning companies cannot match. A truck mount carpet cleaner is a van that has a cleaning unit mounted on its floor. Our operator parks the van near your home or business premise, brings a hose into your home or office and then uses a wand at the end of the hose to clean your carpet. This carpet cleaning strategy offers you greater convenience than conventional carpet cleaning as it will not interfere with the setup in your home. Remember, carpet-cleaning equipment can be heavy, bulky and irregularly shaped. Bringing this equipment into your home takes time and it disturbs the arrangement of furniture in your home. In other words, you might have to move some furniture around to accommodate this equipment. In contrast, truck mount carpet cleaning only brings a hose into your home, which means that cleaning a carpet with truck mount equipment is easy, fast and convenient. You should work with a carpet cleaning company that values your time. This company should have qualified staff with good training and a high level of professionalism. Turn to us for benefits of truck mount carpet cleaning in Marysville, WA. Because we possess these qualities and more. We are timely and thorough when it comes to delivering our carpet cleaning services to our clients. We also use carpet-cleaning materials that preserve the life of your carpet and make it shine even brighter. Our steam cleaners will kill the bacteria in your carpet leaving it safe for use by everyone in the family. Go on. 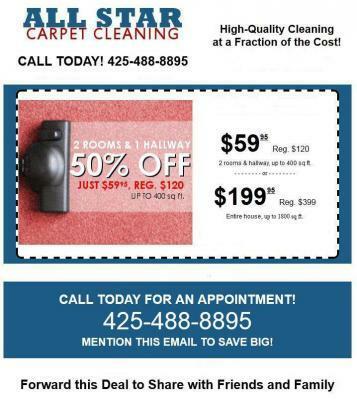 Contact us today and let us handle your carpet cleaning needs.